The MBA board has presented Horizon Connect with an MBA Spotlight Award for its spirit of partnership with the community. From left to right: MBA President Steven Pazienza, Horizon Connect Retail Manager Patricia Slocum, and MBA Vice-President Kathy Hiltner. Photo by Tom Sheckels. In 2011, Horizon Blue Cross of New Jersey charged a task force to find the best place to launch a retail center in order to directly serve the public. After months of research, the team chose Moorestown’s East Gate Square to open Horizon Connect, designed to be a friendly and comfortable resource for people to learn about insurance and navigate their health care options. Another goal for the center was to become a vested partner in the community by offering a free space for non-profit organizations to hold meetings and social gatherings as well as to host a variety of free wellness forums to provide the public with better health information. Moorestown Business Association developed its Spotlight Award program in 2016 to recognize local businesses that go above and beyond to enhance the township through a variety of means, including providing a unique service and spearheading civic service. 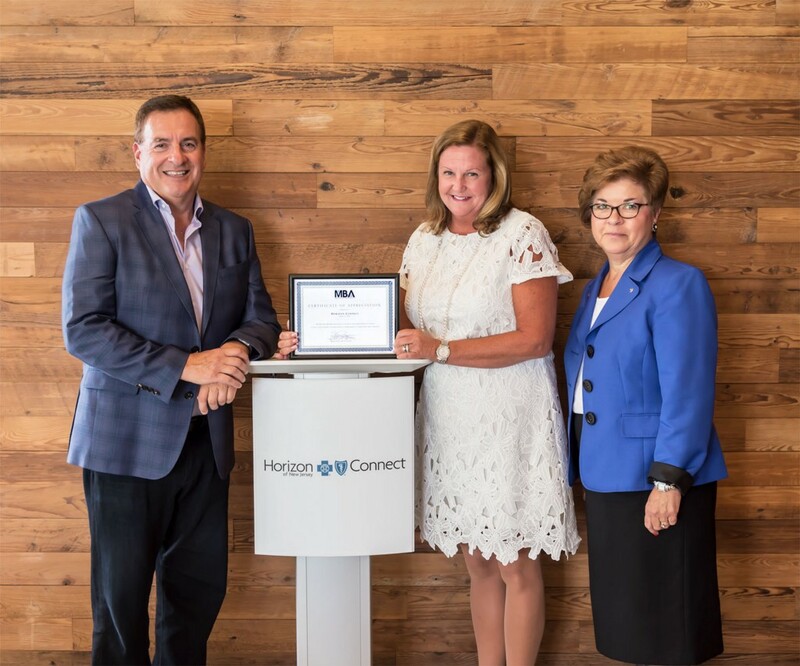 The board has presented Horizon Connect with an MBA Spotlight Award for its spirit of partnership with the community and for choosing Moorestown as its flagship business location. Patricia Slocum, who was on the task force and went on to become the center’s retail manager, said they didn’t know if the concept was going to work, but they believed they were filling a need. Once they opened their doors, the center drew a steady flow of people looking for personal assistance with their insurance. The center also regularly presents free health-related events that are open to the public, such as Family Health & Wellness Day, Senior Day, Women’s Health Day and several others. Their next scheduled event is a Health Screenings Fair on Saturday, Sept. 30. The center’s hospitality toward community non-profits has been of great value to these organizations. Along with health-related groups such as the Alzheimer’s Association and cancer organizations as well as chambers of commerce and other community based non-profits, Horizon Connect has hosted many local arts-related groups with the philosophy that the arts help create a healthy environment. The center has been the scene of musical events, plays, dinner parties and family arts projects. Visitors to the center are treated to a brightly-colored, beautifully designed space that is inviting and comfortable. Those seeking assistance with health insurance are greeted by members of an expert team who can explain all areas of insurance plans. Slocum said that the information people get at the center is presented one-on-one in a way that laypeople can understand, instead of having to decipher complicated documents. In addition to tailoring health-care plans for new customers, the center is a place to get answers about benefits and serves as a “resolution arena” if there are problems with a claim. “It’s the only place in New Jersey where you can get face to face, one-on-one help for all your health insurance questions,” Slocum said. Ninety percent of those who come to the center are repeat clients.